If you are not on Facebook and would like to enter for a chance to win, please either leave a comment at the bottom of this post that says “I want a chance to win an ebook copy of 11/22/63 by Stephen King” or send us an email to read(at)lazydaybooks(dot)com. Make sure you include your name, age (must be 18 or older), city and state where you live. Since we will use email to notify the winner and deliver the ebook, all entries must include a valid email address. The winner will be determined by random drawing on Monday, November 14, at 8p CST. In this brilliantly conceived tour de force, Stephen King, who has absorbed the social, political, and popular culture of his generation more imaginatively and thoroughly than any other writer, takes readers on an incredible journey into the past and the possibility of altering it. It begins with Jake Epping, a thirty five year old English teacher in Lisbon Falls, Maine, who makes extra money teaching GED classes. He asks his students to write about an event that changed their lives, and one essay blows him away—a gruesome, harrowing story about the night more than fifty years ago when Harry Dunning’s father came home and killed his mother, his sister, and his brother with a sledgehammer. Reading the essay is a watershed moment for Jake, his life like Harry’s, like America’s in 1963—turning on a dime. Not much later his friend Al, who owns the local diner, divulges a secret: his storeroom is a portal to the past, a particular day in 1958. And Al enlists Jake to take over the mission that has become his obsession—to prevent the Kennedy assassination. So begins Jake’s new life as George Amberson, in a different world of Ike and JFK and Elvis, of big American cars and sock hops and cigarette smoke everywhere. From the dank little city of Derry, Maine (where there’s Dunning business to conduct), to the warmhearted small town of Jodie, Texas, where Jake falls dangerously in love, every turn is leading eventually, of course, to a troubled loner named Lee Harvey Oswald and to Dallas, where the past becomes heart-stoppingly suspenseful, and where history might not be history anymore. Time travel has never been so believable. Or so terrifying. 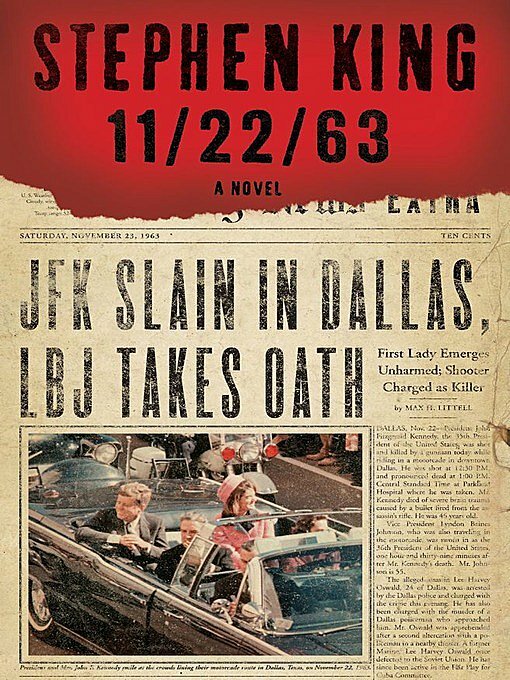 Congratulations to Patsy B., winner of the Lazy Day Giveway for “11/22/63” by Stephen King!